Those who serve our country in uniform risk their lives to defend and protect the freedoms we all value. But far too often, our nation’s veterans don’t receive the support they’ve earned or the services they need when returning home. California’s labor unions are taking the lead to change that. 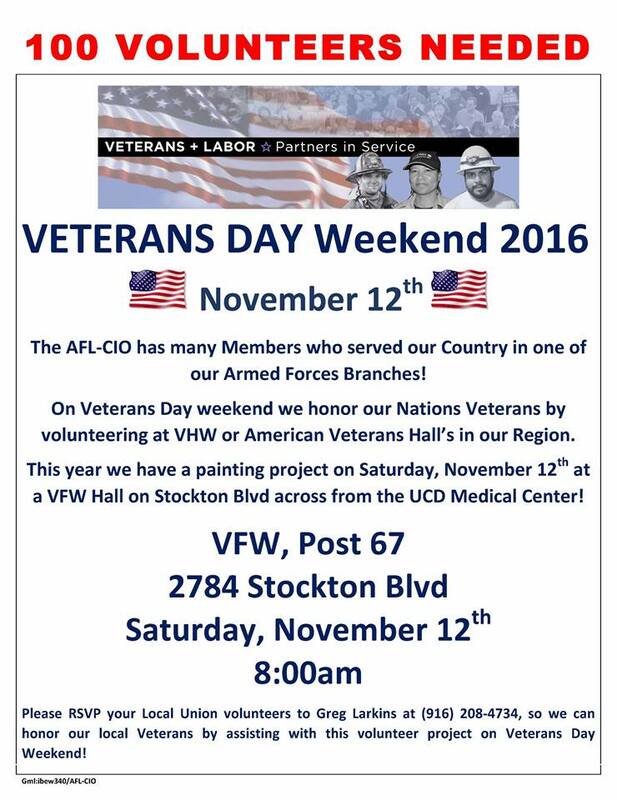 View 2016 California Labor Veterans Day events planned below & check back here for updates! Join the IBEW 1245 Contingent at the Sacramento Veterans Day Parade. Bring your family, friends and veterans! Public Parking in the Crocker Art Museum Lot on O St. Sponsored by California unions, “Veterans + Labor” aims to support and raise up veterans on three fronts: providing volunteer service, opening doors to good jobs and a special Veterans Day event to honor our heroes for their service. 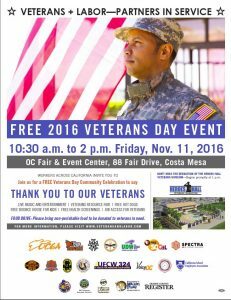 What: Free 2016 Veterans Day Event including a Veterans Resource Fair, Free Health Screenings, Job Access for Veterans, Free Hot Dogs, and more! Food Drive: Please bring non-perishable food to be donated to veterans in need. Our Nation’s Heroes are facing tremendous challenges as they re-enter civilian life. A decent job goes a long way towards helping make that transition a whole lot easier. Developers need to hear from Veterans and our membership fighting for the middle class! The City of San Jose has a responsibility to secure quality living conditions for those who have risked their lives to defend our country. The Pentagon estimates that 8,000 noncitizens enlist in the Armed Forces every year. Their enlistment comes with a promise of naturalization… but there’s a catch. If they ever commit even a minor offense, they will be deported. There are thousands of these veterans – women and men who left their families to defend America and now forever banned from returning to their families. This Veteran’s Day, we will call for the end of the disgraceful way we deport undocumented Soldiers who are honorably discharged from our Armed Forces. After risking their lives for the country they clearly love, it’s only right that they have the chance to realize their own American Dream. Join the LA Labor Movement at our Annual Veterans Day Breakfast as we honor our military veterans. At this year’s breakfast, we will hear first hand accounts of military veterans who were undocumented while serving our country.